α,β-Unsaturated ketones can undergo reaction with a variety of nucleophiles to form 1,4-addition products also called Michael products. Conjugate addition or 1,4-addition is reaction where reagent will add to the conjugated π system of α,β-unsaturated carbonyl compounds. The carbon of carbonyl group is electrophilic and, therefore, it is an excellent place for nucleophilic attacks. 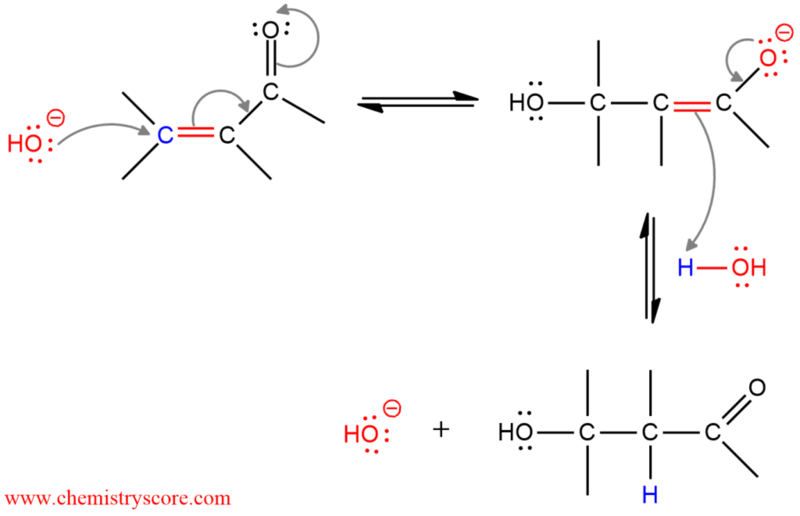 But in these transformations, the nucleophilic reagent attacks to the β-position. The carbon in this position also possesses a partial positive charge (shown below) and is, therefore, a second electrophilic site in these molecules. Mechanisms for conjugate additions with a variety nucleophiles are very similar and can be described in two steps. The nucleophilic part of a regent attacks itself to the β-carbon, and the electrophilic part binds to the carbonyl oxygen. Thus, an enol is formed which subsequently rapidly tautomerizes to its keto form. As a nucleophile can be used water, alcohol, amines, cyanide, and other. These reactions are catalyzed by acid or base, but the products are usually formed faster and in higher yields with a base. And this mechanism will be shown in the following example. And the example of acid-catalyzed conjugate addition can be a treatment of conjugate carbonyl compound with cyanide. This reaction begins with protonation of the oxygen then nucleophilic attack in the β-position and also keto-enol tautomerization.